Early on the morning of November 16, 1864, 150 years ago today, Captain John O’Reilly of the 13th Pennsylvania Cavalry took a party of 50 men, presumably of his own regiment, to scout the area near Lee’s Mill. Regular readers may recall this site being the scene of an earlier, larger skirmish on July 30, 1864, which was completely overshadowed by the massive bloodletting at the Battle of the Crater. Things had changed greatly since late July. 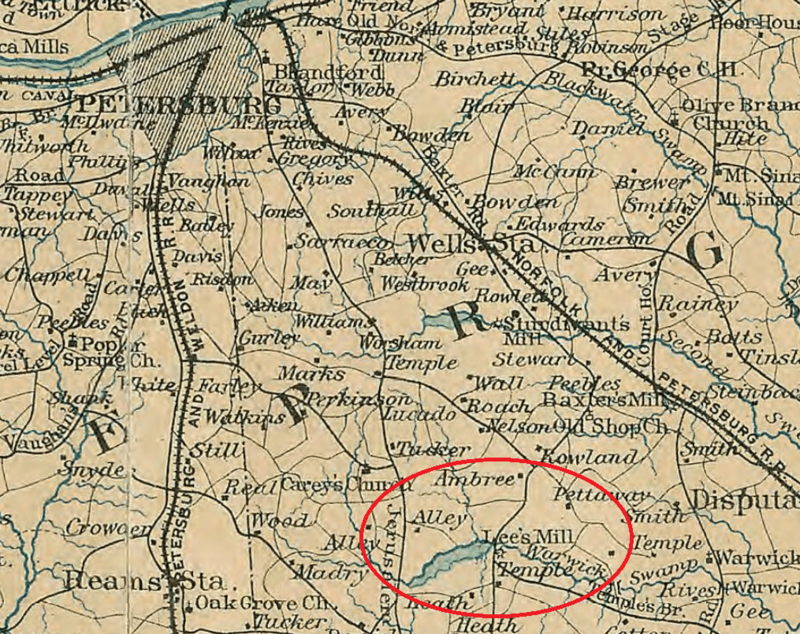 The extension of the Union lines to Peebles Farm and then Hatcher’s Run in September-October 1864 had caused Confederate Cavalry pickets to move further away from the Lee’s Mill area, as Union infantry lines were now more firmly located between Lee’s Mill and the main Confederates trenches. In addition, the successful Beefsteak Raid by Wade Hampton in mid-September 1864 had caused the Union high command to recognize their weakness in this area. A line of forts were built to guard the Union rear and presented no real opportunities for cavalry probes as the area had in the past. As a result, the Confederates typically only operated scouts in this area rather than regular military units of cavalry. It was against such a band of scouts, identified by O’Reilly’s superior Major McCabe as “Rives scouts,” that this reconnaissance and skirmish occurred. 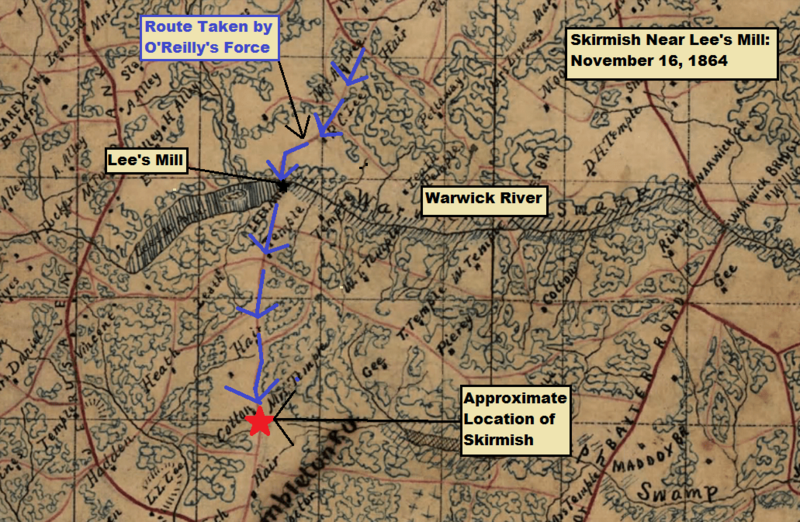 At 4:30 a. m., O’Reilly’s band of fifty men moved south to the Warwick River at Lee’s Mill, well southeast of Petersburg. They then proceeded two miles further south, encountering fourteen enemy scouts. O’Reilly charged these men, killing 1, wounding 3, and killing or capturing 13 horses. The man commanding the scouts, not identified by name, was among the three men killed. O’Reilly’s men suffered no casualties. This little action was not among the more important fights which occurred during the Siege of Petersburg. Rather, it numbered among the hundreds of small fights which occurred on an almost daily basis. These necessary reconnaissance missions often led to brief skirmishes, and sometimes led to deaths and wounds. For those not so intimately affected, it was just another day in a seemingly endless number of days in front of Richmond and Petersburg. More explosive action is upcoming late this November, but that is as always another topic for another day.